Norway is a great seafood nation, ranking as the number one producer of salmon in the world. Its clean waters, long coastline, and climatic factors have made the country extremely well suited for both capturing and breeding of fish. Decades of aquaculture growth have consequently formed a powerful ecosystem of aquaculture innovation, with Bergen at its center. As for many industries extensive growth is accompanied with many challenges. This is also true for the most relevant and industrialized aquaculture industry in the world – the Norwegian salmon industry. Issues related to sea lice, pollution, diseases, fish feed and community interactions have made its marks on the industry, resulting in strict governmental regulations imposed to keep the challenges at bay. Consequently, these sustainability criteria have restricted the growth of the Norwegian aquaculture industry the last decade and industry growth will not be allowed until the production methods leave a smaller environmental footprint. Despite of the fact that governmental regulations restricting growth give aquaculture companies some headache, it also creates a massive opportunity for entrepreneurs entering the industry. Never before have Norwegian aquaculture companies invested more on R&D and the opportunities for aquaculture startups been bigger. The industry is desperate for innovative and sustainable solutions that can help drive the industry forward, setting the scene for the golden age of aquaculture innovation. On the west coast of Norway, right next to the fjords and surrounded by majestic mountains, the city of Bergen is located. Bergen is Norway’s second largest city, with a population size on a little under 300.000, and is well known for its endless hiking opportunities, grand history and amazing local seafood. Most of the major industry players, such as Marine Harvest, Lerøy and Cargill, have their headquarters in Bergen, and many farming sites are within an hour drive from the city center. Bergen is also a pioneer in marine research with several large research institutes located in the area, including the second biggest Institute of Marine Research of its kind in Europe. Bergen has furthermore a well developed cluster environment, facilitating collaboration and networking within the industry. There is a great seafood focus in the city, with many large aquaculture conferences and events held during the year. 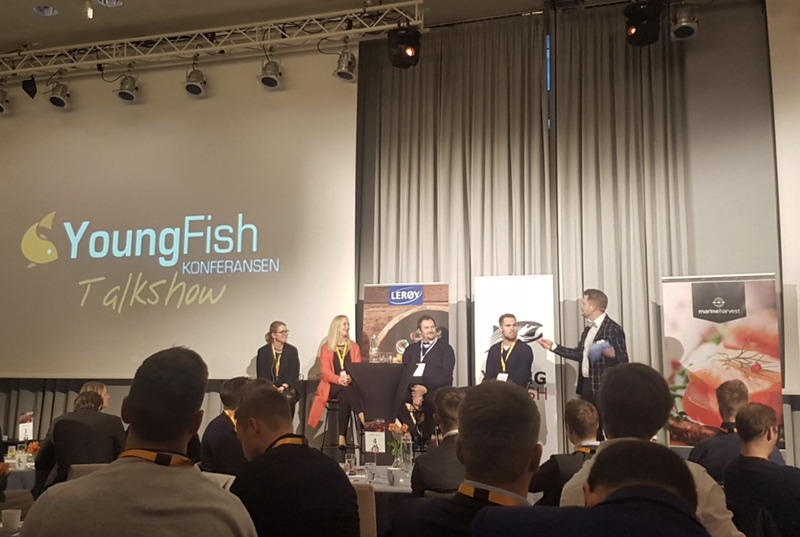 Organizations such as YoungFish, a professional non-profit organization for young people working within the Norwegian seafood industry, also act as important networking arenas. The organization arrange many events, ranging from large conferences to Christmas beer tasting, and is a popular meeting place for young people working in various areas of the seafood value chain. The headquarter for aquaculture collaboration and innovation is located at Marineholmen, a 15-minute walk from Bergen city center. There you find a unique interaction between research institutions, students, entrepreneurs and industry actors, covering the whole marine value chain. The vision of Marineholmen is ”Bridging great people” and to date more than 400 MNOK has been invested in research related infrastructure. Several of the world’s most competent marine academic communities are located here, gaining from the close proximity to collaboration partners. To date more than 150 business and 3,500 employees already work at Marineholmen, and several new offices are under construction. Among the many industry actors at Marineholmen, you also find the most complete and mature cluster in the Norwegian seafood industry, the NCE Seafood Innovation Cluster. Founded by some of the largest industry players the cluster aims to increase growth in national and international markets through innovation and development. To date 90 partners represent over 15.000 highly skilled employees within the seafood industry. Marineholmen is the perfect playing ground for aquaculture startups and is an important meeting place for entrepreneurs from all over the world. There are currently more than a dozen successful aquaculture startups located at Marineholmen, ranging from local to international ones. A growing number of entrepreneurs want to locate their business at Marineholmen in order to benefit from the ecosystem. The attractiveness to startups, the proximity to the industry, the existences of an good entrepreneurial support system and the collaborative atmosphere let us at HATCH decide to locate our accelerator in Bergen. Being at Marineholmen and having a strong partnership with the Seafood Innovation Cluster and BTO, HATCH takes on strong position as a mediator between startups and potential investors. HATCH are seeking talented entrepreneurs who are building scalable startups in aquaculture nutrition, health, aqua tech, genetics, biotech and production. Eight startups will be selected to be accelerated during the three-months accelerator program HATCH. It offers the tools, support and the perfect environment to develop, commercialize and scale innovative aquaculture technologies, and provides access to a unique aquaculture investor network, ready to invest in the best teams with the highest potential. Apart from its services HATCH also invests €25,000 in cash into each startup-company and may provide additional €25,000 in funding during the program. Read more about HATCH and apply here.